I’m sure anyone who needs an insect repellent can agree that application type and ingredients are very important. That was our top criteria for selecting the best insect repellent. If you want to cut to the chase, Simple Natural Products bracelets were selected the “Best Overall” pick from our editorial team. With all of the different choices of insect repellent on the market, a consumer has many different forms and types to choose from. Trying to figure out which ones meet your needs the best can be difficult if you don’t have all of the necessary information. Where you will be using the insect repellent and who you are using it on, plays a factor in the type that will be best for your needs. The top rated insect repellents we have reviewed here are popular with customers because of the ingredients used, their performance and their cost as well. With so many choices available, you want to be sure that the insect repellent you purchase is going to work and that it will be safe for whoever is using it. We’ll give you all the information you need about these top rated insect repellents so you can make an informed decision as to which one will work the best for what you need it for. Many parents do not want to spray their children with chemical laden sprays and lotions. If you are looking for a way to protect yourself and your family from annoying and painful mosquito bites you will love these unique and easy mosquito repellent bracelets. They are all-natural, DEET free and waterproof providing protection from mosquitoes for children over the age of 3, adults and pets too! The active ingredient in these bracelets is 100% Natural Citronella oil. They are super easy to carry and travel with making them great for sports and camping and just playing outside at the family picnic. You will have 240 hours of mosquito free fun per band. Best of all they can be resused. It’s 240 effective hours per band this means that after you use it for an hour put it back in the resealable bag and you have 239 hours left. The 15 Pack offered by Simple Natural Products give you a total of 3,600 hours of protection. Best of all they actually work and deter mosquitoes. If you are anything like me the Zika virus is something that I don’t want to mess with so I bought two packs of these for my family. These flexible bands will fit kids or adults easily and don’t fall off like other products have been known to do. The microfiber and material style bands will smell bad and don’t work. 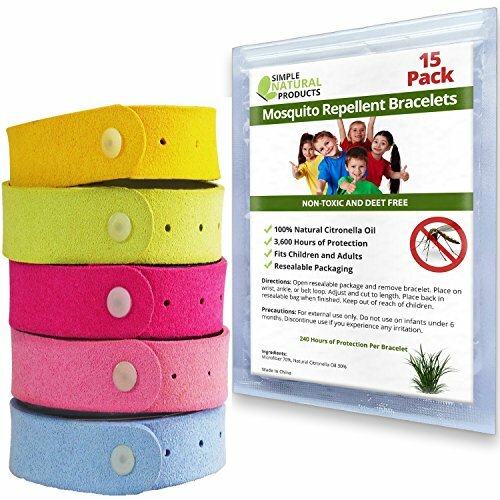 These Mosquito Repellent Bands by Simple Natural Products allow for the full release of the natural ingredient that will last a long time. They work and they’re easy to get kids to use them. Just slip on a band and go. 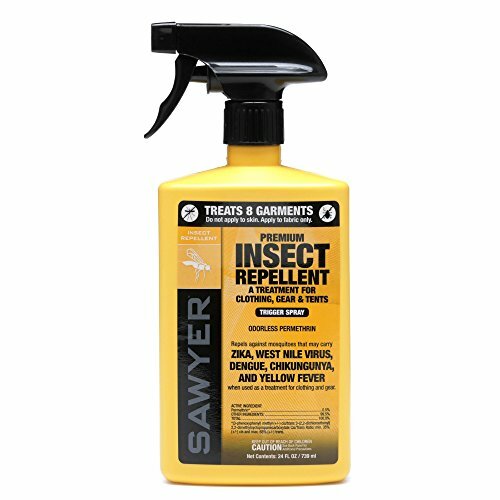 Sawyer Premium Permethrin Insect Repellent is a great addition to any camping trip. It repels and kills ticks, mosquitoes, chiggers, mites and 55 other types of insects on contact. It will not stain clothing and is completely odorless after drying. While not as effective as the insect repellent bracelets we purchased from Simple Natural Products it did perform well and it will also not damage fabrics of any kind, finished surfaces, outdoor gear such as sleeping bags and tents, or plastics. Permethrin is the active ingredient in this product and has been shown to be just as effective as 100% DEET. Permethrin is a chemical so if you want to go the natural route we recommend the Mosquito Repellent Bracelets from Simple Natural Products. It is a great product to use while hunting since it will not give off an offensive odor. You can use it on tents, your clothing, backpacks, sleeping bags and any other gear you have to provide protection against annoying insects that can be prevalent and very irritating when you are out camping or hunting. A single application of Sawyer Premium Permethrin Insect Repellent will last up to 40 days of sun exposure or up to 6 washings. Make sure that the repellent is applied to the clothing before you put it on and let it dry for two hours before wearing. If conditions are very humid, allow it to dry for 4 hours before putting the clothing on. 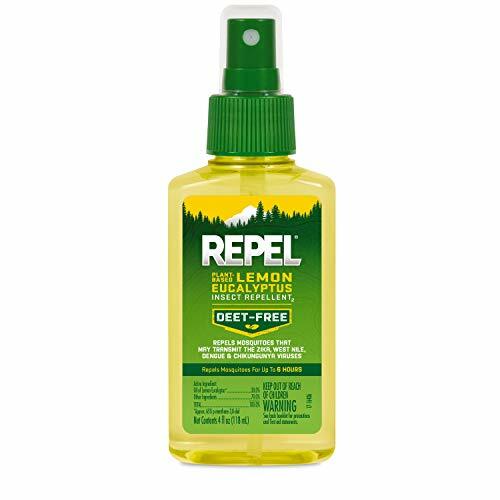 You will have up to 6 hours of protection that is completely DEET free with Repel Lemon Eucalyptus Natural Insect Repellent. I prefer natural repellents and this does work well however the protection is only for 6 hours. Out top pick can last up to 240 hours with a single bracelet. You will get protection from deer ticks, mosquitoes and many other biting insects with this plant based repellent. The active ingredient is oil of lemon eucalyptus which comes from the leaves of the Eucalyptus Citriodora tree. Its oil offers a natural repellent that has a pleasant and refreshing scent. It is the only plant based ingredient that has been recommended by the CDC for mosquito protection. The protection that this ingredient provides is equal to lower concentrations of DEET without any of the dangers that DEET possesses. It works great for your picnics and outings but it should be noted that if you are going to be in severely infested areas, especially those were West Nile Virus or Malaria may be present, you will need the heavier, DEET-based products for your protection against these harmful diseases. When applying Repel Leon Eucalyptus Insect Repellent, use enough to cover the exposed skin and clothing. You will use your hands to evenly spread it, including on your neck and face. When applying to children, an adult needs to apply it and not have the children do it to prevent the insect repellent from getting on their hands and subsequently to their eyes and mouth. This product can be used on children 3 and older and can be applied once every day. Using this product will not stain or harm your gear or clothing. It should not be used on pets. With all of the choices that are available when it comes to insect repellent, consumers need a good way to determine which products are the best and which will be better left alone. These top rated insect repellents reviewed here are customer favorites for many good reasons. They are easy to use, do not contain DEET, are very effective and they don’t cost an arm and a leg either. Whenever you are spending time outside, it is never fun to be slapping at annoying and painful bug. These top rated insect repellents will help stop the biting and you will be able to enjoy your time outdoors safely and without going through a lot of hassle. If none of these top rated insect repellents appeal to you, continue reading our buyer’s guide where we explain more about insect repellents and how to decide which ones are good investments that work and which ones you will be better off avoiding. With the right information you can make an informed decision and choose the right insect repellent for yours and your family’s needs. Not all insect repellents are created equal and there are many factors that go into choosing the right one. We’ll arm you with the tools you will need to understand what you are purchasing. What is an Insect Repellent? It is easy to find dozens of insect repellents available online but that doesn’t mean you know whether they work or not. When you are outside getting attacked by mosquitoes, ticks, biting flies and numerous other biting insects, you don’t want to find out that your insect repellent isn’t all it was stated to be. There are many factors that determine the right insect repellent for your needs. We are going to provide you with the information and knowledge you need to search through the large number of choices available so you understand what these insect repellents are made of and what makes one better than another. Before you start sorting through the numerous choices on the market, you need to be well aware of what you expect and need your insect repellent to do. Ask yourself these questions before you start your search. What Type of Protection do you Need? – Different insect repellents have different ingredients that target specific insects. Where you will be and what you want protection from will dictate the type of insect repellent that will work the best for you. For example, if you are going to be going into a heavily infested area such as for a safari, you will want to get a DEET based product because of the dangers of malaria from mosquito bites. You will need that heavy duty protection that some other types of insect repellents may not offer. Where you are going, the type of insects you want protection from and how heavy the infestations are will all determine which type of protection is best. Some people even get several types of insect repellents that will work for different situations. What form of Insect Repellent do You Prefer? – There are several different methods in which insect repellents are applied. Which kind you prefer will depend largely on whether you need a repellent that goes only on your clothing and gear or repellent that can be applied to the skin as well. Many use a variety of methods, for instance, they will wear a bracelet and spray repellent on gear and the clothing before getting dressed. Scented or Unscented? – Many insect repellents have a strong odor associated with them. Sometimes the scent is more tolerable than others, but if you can’t stand the smell you won’t be able to wear the product. Be sure to read information and reviews on what other customers are saying about the scents of the different insect repellents. Keep in mind that you will be wearing the repellent for several hours at a time. What are the Active Ingredients? – There are many different active ingredients that can be present in insect repellents. One of the most well known and controversial ingredients is DEET. If you are looking for a heavy hitter that will help protect you against Malaria and West Nile, DEET is your ingredient. If you are just dealing with backyard pests and it is not a big infestation, other products like the bracelets or all-natural sprays not containing DEET will do a great job. What Are The Ages of the Users? – The age of the person using the insect repellent does play a part in the kind that you can get. Even some natural insect repellents can’t be used on children under 3. If you are looking for an insect repellent for a baby, you will have to make sure that it is suitable for that age group that you are looking for. Since children are notorious for putting their hands in their mouths, regular insect repellents can pose a risk. Read the bottles and look at the age recommendations. When you start looking for an insect repellent it is important to look for certain features. We’ve outlined some of the top things to look for when you are shopping around. How long does it last? – Constantly having to reapply insect repellent is a hassle if you are going to be outside for an extended period of time, such as when you are camping or hunting. If you are only going to be outside for a couple of hours, and you are not in a heavily infested area, you can get away with an insect repellent that is not as strong or that you can reapply as needed. Slow release over time – Highly concentrated products or products that are slow release will last longer than those that are not. If the insect repellent you are using has higher than 30% concentration of DEET it should not be used on children. Lighter formulas and light scents – Most of the heavy duty formulas that are super powerful tend to have strong scents and will feel thicker and even a bit greasy. These include the DEET based formulas and formulas containing oil of lemon eucalyptus. Lighter formulas are sometimes easier to tolerate and will not smell as strong or feel as sticky. Read customer reviews to see what they are saying about the scent and feel of the insect repellents that you are interested in. You must be careful when applying insect repellent to young children and babies. An infant under two months old is not old enough for any kind of repellent and is better off not being out where they can get attacked by biting insects if at all possible. Concentrations of more than 30% DEET should not be used on children at all. Oil of lemon eucalyptus is another product that is not recommended for children under three even though it is a natural, plant based product. Never let little ones apply their own insect repellent because it will be on their hands and then can end up in their mouths and eyes. When spraying aerosol type insect repellent, spray in a well ventilated area and do not spray the repellent towards or onto the face. Spray into your hand and then rub it onto your face, avoiding your eyes and the fragile area around the eyes. When using a new insect repellent, it is better to test on a small area of the skin first rather than spraying or spreading it all over and then finding out that you are allergic to it. One of the best places to test is inside of the elbow. Do not apply insect repellent to the skin that is not exposed. If clothing covers it, you will not need to worry about that skin. Concentrate on the skin that is exposed such as arms, legs, hands, face, head, etc. Be sure to read the bottle to make sure that the insect repellent you are using does not harm or stain clothing. Never apply insect repellent to skin that is cut, irritated or open in some way. Aside from burning tremendously, it can also cause other problems for the wounds that are healing. When you are going to be out in the sun, be sure to apply the sunscreen first, let it dry and then the insect repellent. Avoid using DEET products with sunscreen because it could increase the DEET absorption in the skin. When you have applied DEET containing insect repellents to the skin, it is important to wash off with soap and water after going back inside. Be sure to remove the clothing you had on and wash it as well. With all of the varieties of insect repellent on the market, there is a type and kind for every use. With the right knowledge and information you will be able to sort through those choices and decide which one is the right one f or you. The top rated insect repellents featured here are very popular choices for a variety of circumstances. We’ve given you the information about these products and also have armed you with the tools you need to sort through other choices and find the one or ones that will work for the outings that you go on. Insect repellents can help make outdoor time much more enjoyable but it is important to get the one that will work to keep away the insects that you will encounter and that will work for all family members. Now that you know what to look for, you can be confident that the choice you make will be a good one.